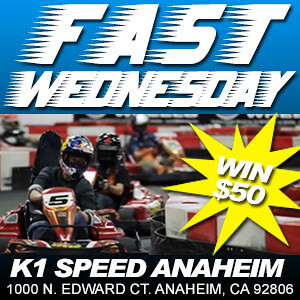 Are you the fastest racer at K1 Speed Anaheim? Prove it on “Fast Wednesday” where we’ll hand out a $50 AMEX gift card to the racer that posts the Fastest Lap that night! That’s right…a $50 gift card good anywhere that AMEX is accepted. Kogi BBQ will be on-site serving up some of their amazing food to hungry customers.